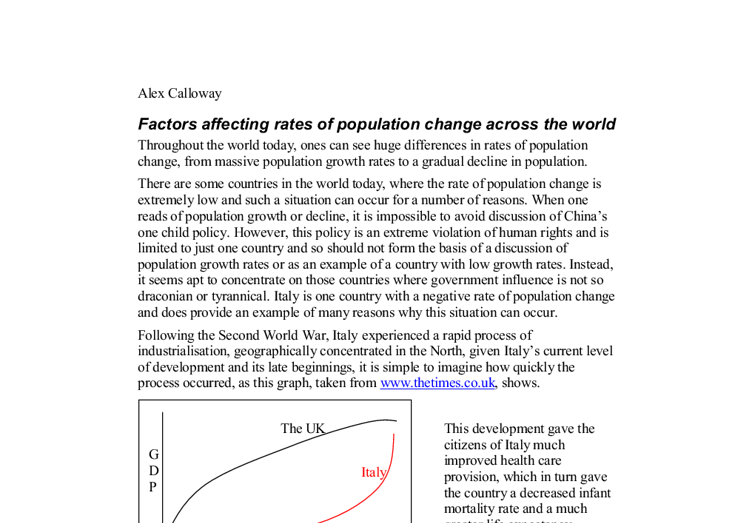 Alex Calloway Factors affecting rates of population change across the world Throughout the world today, ones can see huge differences in rates of population change, from massive population growth rates to a gradual decline in population. There are some countries in the world today, where the rate of population change is extremely low and such a situation can occur for a number of reasons. When one reads of population growth or decline, it is impossible to avoid discussion of China's one child policy. However, this policy is an extreme violation of human rights and is limited to just one country and so should not form the basis of a discussion of population growth rates or as an example of a country with low growth rates. Instead, it seems apt to concentrate on those countries where government influence is not so draconian or tyrannical. Italy is one country with a negative rate of population change and does provide an example of many reasons why this situation can occur. Following the Second World War, Italy experienced a rapid process of industrialisation, geographically concentrated in the North, given Italy's current level of development and its late beginnings, it is simple to imagine how quickly the process occurred, as this graph, taken from www.thetimes.co.uk, shows. ...read more. Whilst not quite a case of quality over quantity, this very British idiom does serve as a useful summary of the Italian philosophy to childbirth. This change of attitude occurred very rapidly and so it was not only the rapidity of development, which resulted in a low growth rate. Social factors in general, have far more influence on rates of population change in the modern world than economic or even physical factors. Social attitudes must change for growth rates to change and they are often what cause differences between countries. For example, in Russia population growth rates are almost as low as in Italy also as a result of social attitudes, but for very different reasons to Italty. Since 1985, the birth rate has halfed as a result of a change in society's attitudes. Russian women do not want to have children as they perceive the situation in their country to be so dire, that children do not deserve to be brought into it and that they could not provide for them if they were. Following the end of communism, life expectancy dropped by 6 years - the fastest recorded decline in an MEDC and was accompanied by a rocketing death rate. This was a result of poverty, political upheaval and unemployment and its accompanying problems. ...read more. This is a common situation throughout the LEDW and there are very very few countries in which it is economically beneficial to have more children. Instead, it is simply society's attitude towards children, which causes such a high growth rate. In Ghana, the birth of a child is seen as an occasion to celebrate and it is almost unthinkable in most communities to stop such an event occurring, using contraception. The culture of the country is such that children are seen as a blessing and this is the reason for the high growth rate in Ghana. Explaining the reasons for the culture of a country is an extremely difficult task anywhere, and is no less challenging here. It may be a result of the strongly religious feelings of many Christian communities in Ghana or simply be a result of tribal traditions hundreds of years old. Whilst the rate of economic development may affect the rate of change of attitudes, it could still be said that the reason for the wide range of population growth rates is the wide range of social attitudes, irrespective of a country's economic situation. There are many different reasons for different social attitudes, whilst some cannot be explained other than by tradition. Human beings are capable of making a choice, and it is this ability, which causes the wide range of population growth rates around the world, each country's citizens have a different situation and so a differing social attitude. ...read more. 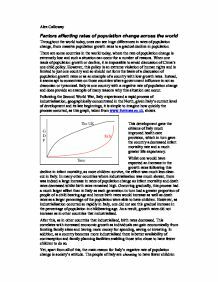 An excellent account of the reasons why population growth rates vary around the world based on three well chosen and justified case studies. Further incorporation of data demonstrating birth/fertility rates in comparison to death rates would benefit this answer. Also thin soil (on mountains), soils in rainforests (which have had all the nutrients drawn out by the trees) and frozen soils do not have the ability to support a large population, areas like this are the Amazon Basin and The Sahel (Africa). Quality Toxeth 18th & 19th Century/Modern 3 storey quite large Private Straight/Varied none some mixed mixed Renshaw Factory/Hospital 54/100 Eldonians 1980's semi-detated 1,2,3 beds Rent Cul-de-sac none some yes Bungalows/houses community centre/sprts centre 84/100 Albert Docks Modern Flats 2-beds Rent Straight underground parking yes no flats close to CBD/Tate Gallery/Museums/Offices 92/100 Project Rosemary in Toxteth. Ecumenical events such as carol services and fund-raising activities can give the young people in rural communities a sense of belonging and purpose. The young people are also aware that it is the clergy who have the most access to youth resources such as halls and schools etc. The elderly are witnessing no difference because they are receiving the same. The UK as a whole however must forgo more in order to allow the government an increase in expenditure (towards the elderly) as a result the standard of living decreases. This is proved by the Netherlands having a large percent of its women receiving secondary education, and consequently, they have a low birth rate. Other examples are the UK, Japan, Canada and Hungary. Religion plays a large part in contributing to crude birth rates. believe that a typical Indian family is smaller`` Retirement benefits for smaller families Availability of maternity leave for only the first two children in a family. b) Which policy was more successful in reducing birth rates and why? Between 1981 and 1991, the annual rate of population growth was estimated at about 2% in India.